Lunca Bradului (Hungarian: Palotailva, Hungarian pronunciation: [ˈpɒlotɒilvɒ]) is a commune in Mureș County, Transylvania, Romania. It is composed of three villages: Lunca Bradului, Neagra (Nyágra) and Sălard (Szalárd). The left tributaries Ghiorfaș Creek and Schwartz River and right tributary Bisericii Creek flow into the Mureș at the village. ^ Romanian census data, 2002 Retrieved on April 18, 2016. 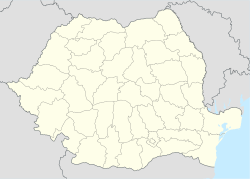 This Mureș County location article is a stub. You can help Wikipedia by expanding it.